Clearly, I enjoy writing (I do run a blog with many more words than pictures, after all). My writing began not long after I learned to read, but mostly consisted of short stories that were meant to be novels and a highly emotional diary in the sixth grade written in milky pens (remember those!?!?) which I ultimately threw sacrificially into a fire after realizing that my crush would never return my undying love #struggles. On January 1, 2008, when I was in the eighth grade, I began a journal and wrote everyday until my junior year of high school when applying for colleges took over my life. I returned to journaling on my first day of college, stopped when I decided to dedicate time to my blog, and I've recently resumed. Since starting up again I have realized how essential journaling is to me and my intentionality. 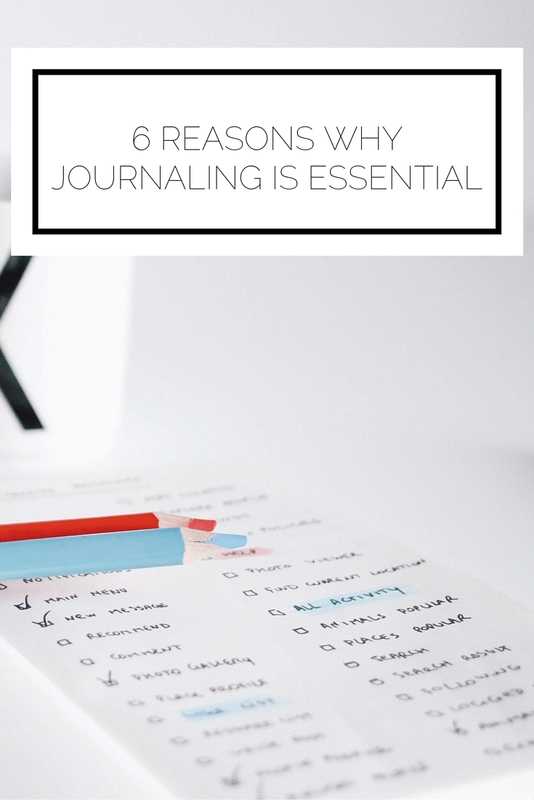 Here are six reasons why everyone should journal and why I'm recommitting myself to it. It's fabulous to have a record of your life. Sure with social media you can look back at any given day and see what you were up to, but can you recall your feelings and fears and struggles? No. Through a journal you can revisit your euphoric moments and your times of utter despair (like me and my sixth grade crush. Why wouldn't he sit next to me at lunch, oh why!). It will be helpful when they make the movie version of your life. I don't know who 'they' are but they are going to make a movie about me and it seems only right for me to give them something to work with. I'm just thoughtful that way. It's nice to actually write something by hand. It is a rare day when I hand write rather than type, but it makes a nice change. I also enjoy choosing my journal and seeing later how it was a reflection of my taste and style at that time. It forces you to think. Writing helps me to work through everything that has happened in the day, figure out what I need to do to address it, and helps me to live intentionally. Taking the time to process is so important to allow you to have a clear idea of how you want to proceed with anything you're dealing with. It gives you closure. Once you've written about something that's bothering you, you can let it leave your head. Putting your troubles down on paper enables you to focus on other things. The benefit of this can't be overstated! Your journal is your constant friend. You can pull out your journal anywhere at anytime, you can always have 'someone' to talk to, and you can reminisce. Treating your journal like your best and wisest friend means that you are never alone. Do you journal? Are you considering starting? This is a lovely post! You're a very engaging writer. I used to journal but after finishing a whole notebook I sorta gave up on it. Definitely will be looking into starting it again. And I look forward to watching the movie version of your life! Really pretty picture in the sidebar btw! Your comment made my day Steph! I am so glad that you enjoyed this post and highly encourage you to get back to journaling. I'm nearing the end of my current journal and my roommate from last year just got me a new one; it is so fun to start a fresh notebook :) The picture on the sidebar is courtesy of my best friend Ally; she is such a talented photographer. I journaled all the way through high school and then became much more sporadic... wish I would have kept up with it! It's never too late to go back to it! Love this! I don't journal per say, but I do blog which I feel is like my online journal lol! Happy friday girlie! P.S. think you would adore the Feeling Tribal outfit post we shared on the blog today! This is awesome. I'm taking a creative writing class this semester called "Gendered Memoir" and having my blog and multiple journals has been SO helpful for focusing on a story that I wanted to work on for class. Your blog is awesome!